There did not seem to be any clear criteria for banishment . Banishment out of Scotland in some instances meant a swift move to Berwick and over the border into Northumberland. In the reign of Charles I and II the range of penalties for non conformity were extended with the death penalty a possibility thus some ministers went into voluntary banishment ere the hangman did his work. The place of banishment in Scotland was often to the north and the Highlands where there was not much Covenanter support, yet sometimes the minister might be allowed to choose his own place of incarceration. Other variations on the theme were instances of ministers being told to remain in a place pending the King`s pleasure, this was usually pending the consideration of the charges. The term ` warded` is also a form of banishment – a person might be warded to Dundee, meaning he must remove himself there within a specified period and remain there – a sort of banishment under open arrest. The penalty for breaking a warding, such as slipping off to visit family left behind, could be a financial penalty or ` horning` meaning declared a rebel with forfeiture of property and titles – and exposure to a more rigid penalty regime including hanging. David Black , a colleague of Andrew Melville at St Andrews, got into trouble by declining the Kings supremacy in matters of doctrine. He was first warded to the north side of the Tay at his own expense to await the Kings pleasure where he lingered for nearly a year. Shortly after returning to St Andrews he was proceeded against, again, and this time banished to Angus where he subsequently died. John Scrimgeour was minister at Kinghorn in Fife and had been chaplain to James VI when James went to Denmark to fetch his Queen. He was summoned before the Court of High Commission for not preaching on holidays and not administering the Communion according to the Articles of Perth. His first appearance got nowhere because there were too few members of the Court. On reappearance some weeks later he faced a penalty of being deprived of the exercise of the functions of a minister for life. He put up a spirited defence in debate and it may have been his reference to his ill health, (or having discussed issues with King James previously), that caused the Archbishop to relent on banishment to Dundee and allow Scrimgeour to go to his own residence at Bowhill in the parish of Auchterderran. David Calderwood is a prime example of a minister declining the authority and alleged headship of the church by the King. He first declined authority in 1608 and was confined to his parish where he remained until 1617. He was then called before the Court of High Commission, with the King present, and rebutted all questions and criticisms with great skill. 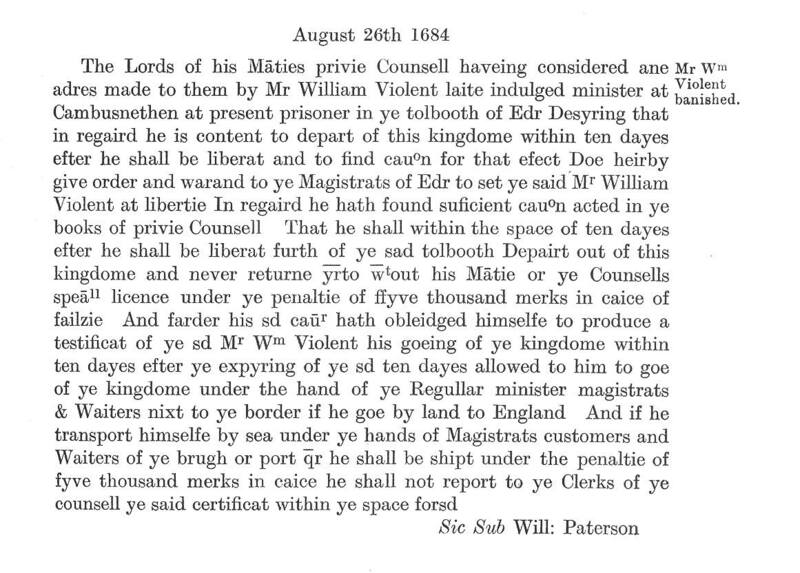 In the end the King asked if he would obey sentence to which Calderwood replied “ Your sentence is not the sentence of the Kirk, but a sentence null in itself, and therefore I cannot obey it.” An invitation to retribution if there ever was. Robert McWard and John Brown were stalwarts of the the Reformation who after banishment became very influential in Holland. It was to them that other Covenanters often turned ; they were responsible for several ordinations of ministers, including Richard Cameron and James Renwick. It was probably because of his advancing years that the very influential Samuel Rutherford was banished to Aberdeen . Other Covenanter greats such as David Dickson, Robert Blair all suffered banishment within Scotland and a suspicion lingers that this was in order that they remained within striking distance of the government. 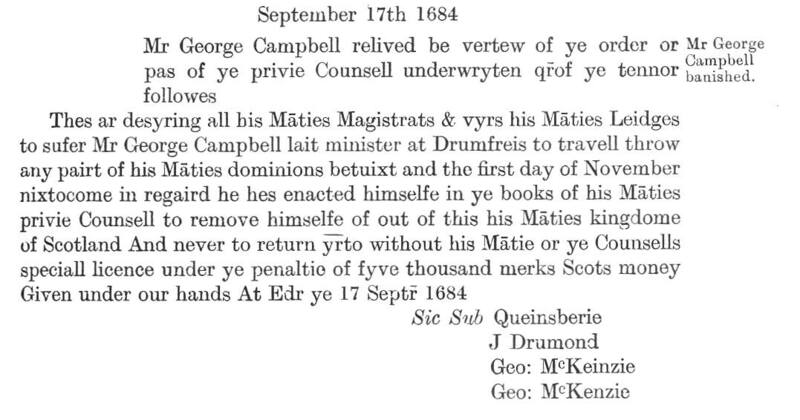 Then there were those who simply disregarded their sentences – Donald Cargill and William Gordon were two such Covenanters. Cargill was banished to the north side of the Tay for allegedly being a seditious person. This arose because he had preached on 29 May 1660 – the day of the Restoration of King Charles II. , and not being a person that was easily cowed by authority he had taken his sermon from Hosea ix. 1 “ Rejoice not, O Israel, exult not like the peoples; for you have played the harlot, forsaking your God.”. 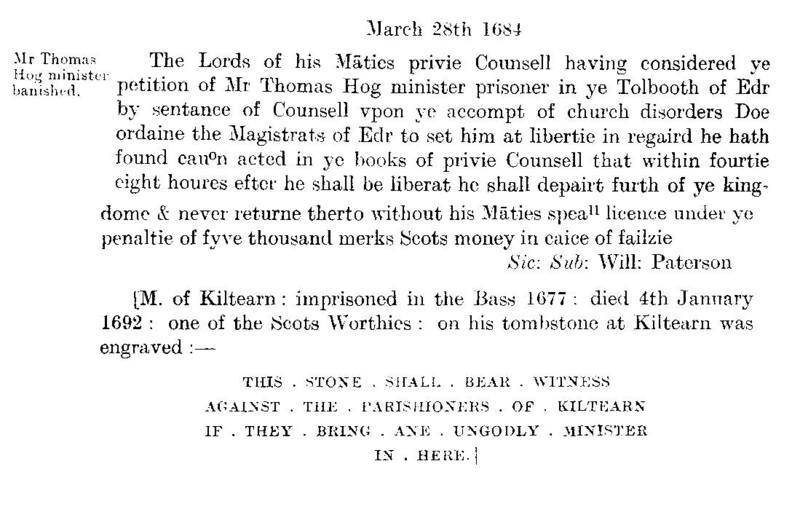 Thomas Hog(g), minister of Kiltearn, suffered more than many having a stay in the Bass then pursued again and forced into banishment.